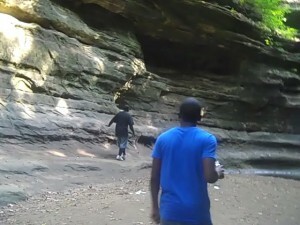 Editor’s Note: The following photographs were taken during a fact-finding trip to Starved Rock State Park by the Eco Youth Reporters. I can’t swim and I’m afraid of water, so I never would have imagined in a million years that I would ever go kayaking. 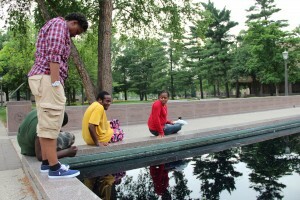 But right before school began, I got a chance to try it with my fellow Eco Youth Reporters. And it was one of the most rejuvenating experiences in my life. Our tour guide was Noah Stein with the company Chicago River Canoe and Kayak. He was wonderful and completely understanding but he was really serious about safety and the risks of being on the water. I was sort of reluctant to get in a kayak by myself, so Noah decided it was in my best interest to partner up with Alisha Jacobs, which was a great idea. Noah went over all the important logistics about kayaking. We had to first pick out single or double kayaks. After we had done that, Noah helped each of us change the gears in the boat for our own comfort. For the ones who were in double boats, we had to decide if we wanted to be a front paddler or a back paddler and gear changer. At first, I thought I wanted to be in the back paddling and changing gears. Then Noah explained that experienced kayakers usually sat in the back because it would be difficult for a beginner to focus on paddling and changing gears. So I was switched to the front. 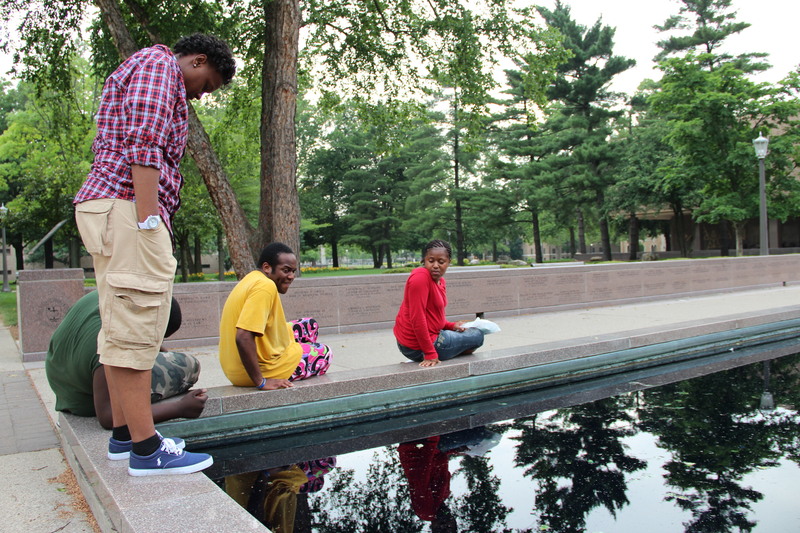 Eco Youth Reporters Tyreshia Black, Antonio Reed, Jasmine Hunt at the reflecting pool at the University of Notre Dame. Photo by Kari Lydersen. By pulling out a single strand of hair, your DNA instantly becomes environmental DNA or eDNA and this concept may help us save the Great Lakes from the potential devastation of the Asian carp. I didn’t understand this until I met Chris Jerde at the University of Notre Dame on a trip with my journalism classmates. Jerde’s current job is to extract eDNA from water samples to search for a trace of Asian carp but this process can be used for other things to in the near future. He demonstrated by filtering water through special filters that captured algae and other microorganisms, allowing the eDNA to collect in sterile containers for testing. 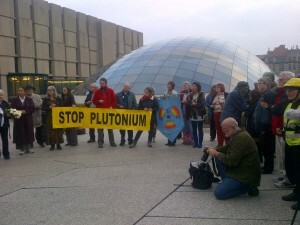 Protestors gather on the 70th anniversary of the first controlled nuclear reaction near the site where it occurred on the University of Chicago campus on Dec. 2, 2012. Photo by Tyreshia Black. The abstract sculpture by Henry Moore on the University of Chicago campus looks like a soldier’s helmet or maybe a mushroom cloud or a skull. It was created to mark the first controlled, self-sustaining nuclear chain reaction, which was done at the university on Dec. 2, 1942. Exactly 70 years later, on Dec. 2, 2012, many people came out to pay their respects at a conference at the University of Chicago. But there certainly were not as many people as should have come, given what nuclear reactions have meant for our society. Many people were not even aware of the event or the history behind it. 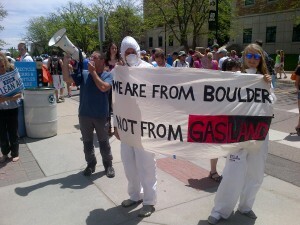 I personally never knew of the historical event until I attended the commemoration at the university. Luckily, I had a chance to meet several activists who gave me insight on what is going on and their concerns about nuclear power and nuclear weapons. UYIJP participant Tyreshia Black interviews Chicago teacher Cynthia Smith at a Nov. 2 sit in against school closings. Photo by Kari Lydersen. Chicago Teachers Union Vice President Jesse Sharkey, who I interviewed, proclaimed that he was putting those who are causing problems “on notice.” Sharkey meant that those who are making the choice to close schools and lay off teachers and – in his view – deny children the best education will have to face him and many others. 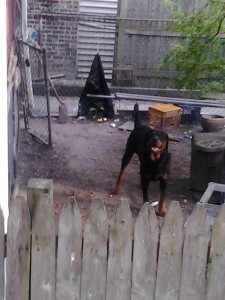 This dog happens to be behind a fence, but many canines roam the Englewood neighborhood off the leash, terrifying pedestrians. Photo by Tyreshia Black. The dog had white and gray fur, and blue piercing eyes. Its teeth were long and yellow. The ears on its head were perked up. The dog’s face looked angry and determined to kill. 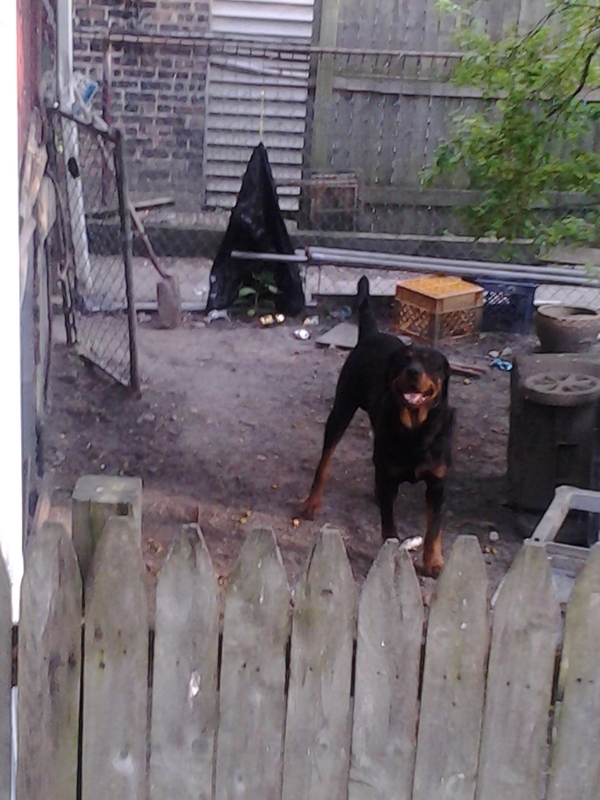 I encountered this dog while walking out of my house on a normal day to school. I was about a block from my home when the dog came around the corner. When I saw him, I quickly stopped walking, attracting his attention. The dog gazed at me, like a wolf staring at a deer in the forest. As we locked eyes, he made the first move and circled me about three times before he sniffed my leg and shoes. I felt an urge to run but I knew what would happen next – he would kill me. 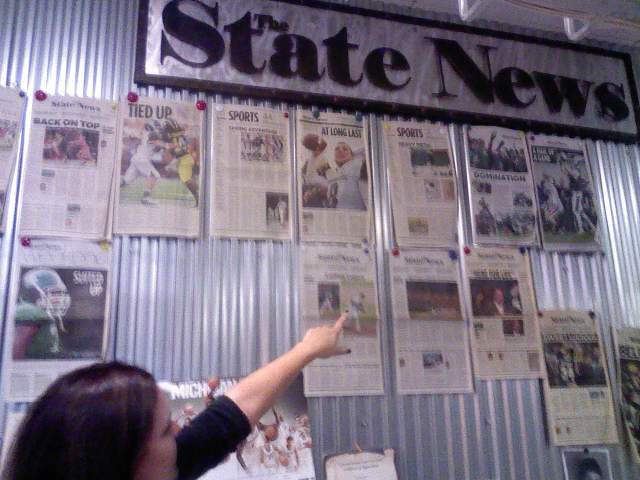 The student editor of Michigan State University's State News shows off recent editions of the publication during a visit this fall to the academic institution's campus. Photo by Tyreshia Black. Every year, high school students across Chicago start preparing to attend a college or university. The effort is a big undertaking, and it is easy to get overwhelmed. There are so many different types of higher education institutions to choose from, and a lot of students don’t know what they’re looking for. One important way that many students figure out what they want from a college is through a campus visit. During a visit, prospective students tour the campus, talk to professors, and learn about student life. “It’s a lot of pressure,” said Tametrius Files, a 16-year-old Simeon High School student who has visited Eastern Illinois University, DePaul University and other schools. Experts say it is important to make the most out of college visits. Betty Weinberger, a college consultant at a Glencoe-based company called North Shore College Counseling Services, said in an e-mail interview that students must make realistic and appropriate plans in order to ensure their campus visits are worthwhile. Ms. Weinberger added that students should also think about college activities while on a campus tour as well as their fields of interest.